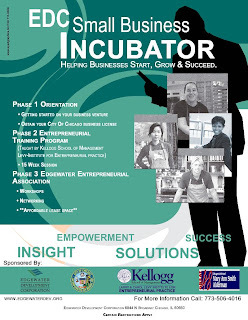 EDC Small Business Incubator Reviewed by Edgeville Buzz on January 14, 2011 . From the Edgewater Development Corporation…. Thinking about starting a business in 2011? Trying to find the right city location for your new business venture? The City of Chicago’s 48th Ward is open for business! To help promote economic growth and development in the burgeoning Edgewater neighborhood, the Edgewater Development Corp. is hosting a kickoff event to introduce the Small Business Incubator (SBI) program to entrepreneurs and small business owners.